HyperX, the gaming division of Kingston Technology Company, Inc. and brand leader in gaming and eSports, today announced the first HyperX We’re All Gamers ad campaign which will run across television, digital and social in 2019. 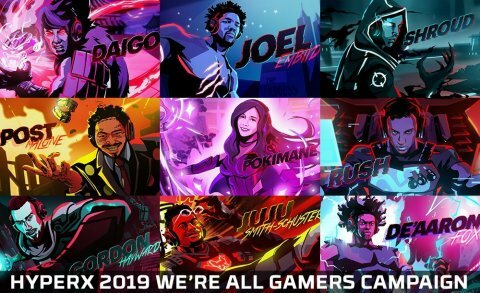 The campaign features a diverse talent roster including Post Malone, Joel Embiid, Shroud, Gordon Hayward, Pokimane, JuJu Smith-Schuster, Daigo, De’Aaron Fox and Cloud9’s Rush. It showcases the individual illustrated gaming spirit of each of the personalities participating. Creative leadership is led by the agency Envoy. In addition to commercial time and integrations on ESPN, campaign exposure may include VOD and social media channels like Twitter, Instagram and Facebook. The campaign is designed for viewing in multiple segment lengths of 6, 15, 30 and 60-second spots. HyperX expects to expand the campaign to include more influencers and celebrities throughout the year, including soccer players and others who are passionate about gaming. HyperX is a champion of all gamers. It doesn’t matter if they play on console or PC, are NBA or NFL athletes, popular streamers or eSport professionals, or are even music icons - the thrill of gaming is what truly unites them all, and HyperX helps them game at their best. The integrated global We’re All Gamers campaign in 2019 is expected to be the first of many new activities in promoting the HyperX brand to consumer and lifestyle audiences.